3D art for the better way. 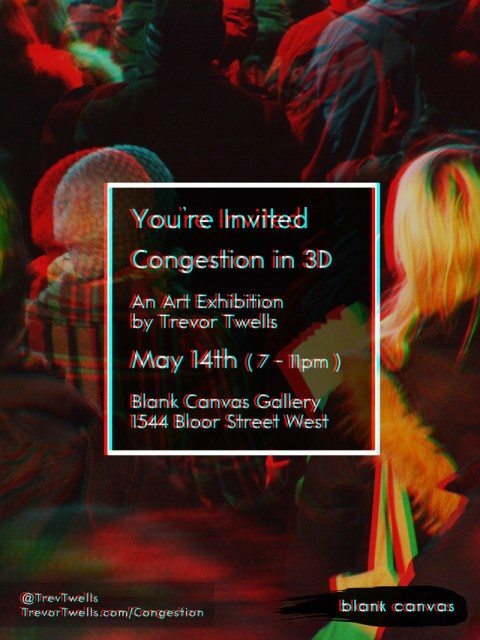 The art exhibit “Congestion in 3D” by Trevor Twells opens on May 14 at the Black Canvas Gallery at 1544 Bloor Street West. 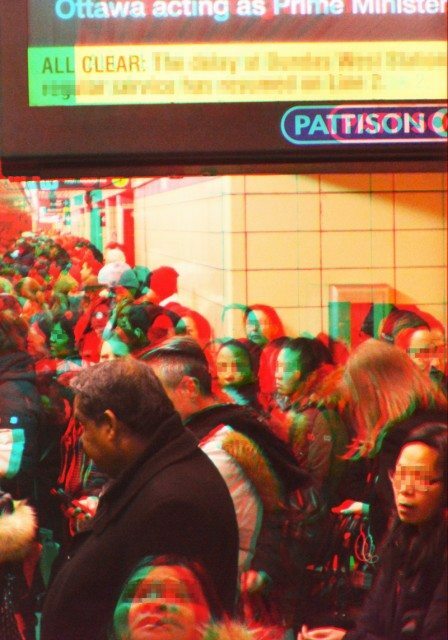 An upcoming art exhibit will allow you to relive the cramped details of your TTC commute, all in glorious 3D. 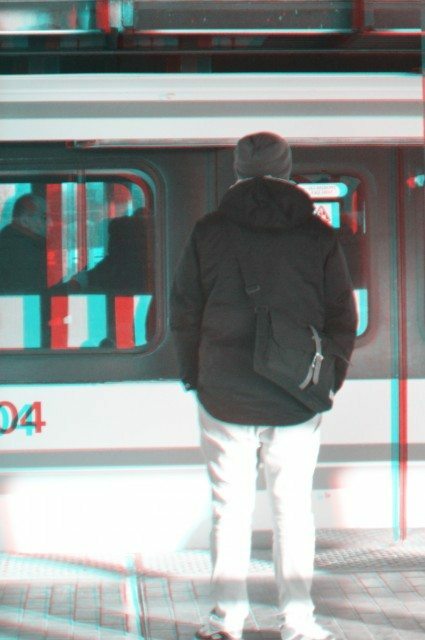 Using anaglyph 3D images, the project is aimed at people who might not otherwise take the TTC during peak hours, and Twells hopes the project will spur action amongst government officials who have the power to make things better. 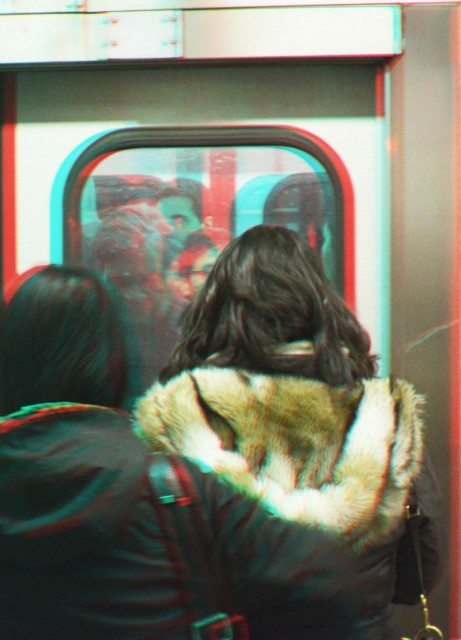 Drawing on his daily two-hour commute from Scarborough to the downtown core, Twells wants to provoke Torontonians to actively think about TTC commutes. Attendees to the art exhibit, which opens on May 14, will be given 3D glasses to see the art, which is meant to provide an immersive experience. Twells argues the state of the TTC’s infrastructure is unsustainable to serve its ridership needs, and immediate action is needed to turn it around. In the exhibit, he uses his personal commute as a stand-in for widely felt problems. Pictures include the congestion at Kennedy, the Yonge-Bloor interchange where he transfers each morning, and Queen Station, where he gets off for work. He leaves his house at 7 a.m. to arrive at work for 9 a.m.
It’s not Twells’ first art project involving the TTC. In early 2014, the artist rebranded station platforms with pop culture icons. Castle Frank station became Frank Castle, an homage to The Punisher. As a professional designer, Twells says that rather than zoning out, he actively thinks about how the TTC works on each trip he takes. Sometimes that’s thinking about the font at Old Mill station, but often it means thinking about the bigger picture, and how Toronto’s transit requires more funding and support. Part of the goal of his exhibit is to encourage fellow TTC riders to also be active thinkers about the transit agency’s needs. “I want people to live and breathe that commute with their brain turned on,” he says. Most of all, he adds, he wants people in power to make that switch so that Toronto commuters can finally see real improvements. “Congestion in 3D” will run from May 14 to 21 at the Black Canvas Gallery, at 1544 Bloor Street West. The opening night reception is May 14 from 7 p.m. to 11 p.m.